This report summarized the discussions and presentations held among the approximately 200 participants from 45 countries who attended the workshop on Sustainability in Electoral Administration and Processes in Maputo, Mozambique. Both the discussions on the costs and funding of electoral processes and the related recommendations made by the participants may be of use for other EMBs as well as for electoral assistance practitioners. Built upon the experiences gained by the European Commission (EC) and United Nations Development Programme (UNDP) in formulating electoral assistance projects, this publication draws lessons learned from that implementation in order to assist the staff of UNDP Country Offices and European Union Delegations on the design and formulation of electoral assistance projects, as well as the administrative framework documents that govern that cooperation. This Summary Report of the EC-UNDP Thematic Workshop on ICT and Elections Management deals in-depth with the issues and challenges of introducing technology into various elements of electoral administration. These elements range from the registration of voters to the management of results of the elections. The publication also looks at the role –and challenges– of working with biometric technologies. This includes a discussion on some of the advantages and disadvantages of eVoting systems. This summary report of the EC-UNDP Thematic Workshop on Elections, Violence and Conflict Prevention that took place in Barcelona in June 2011, looks at the links between elections and violence analyzed through the prism of three critical phases in the electoral cycle. The purpose of this report is also to propose preventive measures that should be adopted to mitigate the escalation of election-related violence and conflict throughout the electoral cycle. This participants’ guidebook consists of an overview of the work that the EC and UNDP collaborate on in the field of electoral assistance. The book sheds the light on a wide range of issues such as election-related violence, the EC and UNDP Policy and Strategic Framework, electoral assistance activities and global tools for effective electoral assistance. This paper analyses the experiences from electoral assistance projects, especially in Sub-Saharan Africa, that included the introduction of information and communication technologies (ICTs) for voter registration processes and the procurement of the related electoral material and services. The content aims to provide a resource for stakeholders contributing to or benefiting from electoral assistance.While focusing primarily on UNDP rules, it pays specific attention to major aspects associated with the procurement and the application of ICT solutions in voter registration. With close to 500 entries, this tri-lingual (Arabic, English and French) lexicon provides clear and accurate explanations of key concepts and terms in the field of elections. The Lexicon documents the most widely accepted electoral terms in Arabic accounting for regional language variations in eight participating countries, namely Egypt, Iraq, Jordan, Lebanon, Libya, Palestine, Tunisia and Yemen. Electoral practices and experiences vary widely across the Arabic-speaking world and different terms are used in different countries to refer to the same roles or activities in the electoral process. This Lexicon is a first effort to bridge that gap. Persons living with disabilities represent various ethnic, religions, socio economic and gender groups. They form approximately 15% of the world’s population roughly one out of every seven. 80% live in low-income countries like Sierra Leone. This compendium aims to assist EU Election Observation Missions and other interested stakeholders in clearly identifying the international standards to use in assessing the conduct of elections. To facilitate such assessment, a practical guide has been included as an annex. It is the Commission’s expectation that EU Election Observation Missions will make use of this new tool to assess the conduct of elections in line with international standards and ensure coherence among EU Election Observation Missions. ELECTORAL FINANCING TO ADVANCE WOMEN’S POLITICAL PARTICIPATION: A GUIDE FOR UNDP SUPPORT. This primer offers an introduction to the intersection of gender and electoral financing.Money is a prerequisite for competing in most political systems today, but patterns of gender discrimination force women candidates to make do with more limited resources than men. The document outlines the role that political systems play in shaping electoral financing options and outcomes, and gives a summary of basic campaign financing constraints that women face. It provides UNDP policy advisors and programme staff with a framework and entry points for supporting women’s increased access to funds and the political system at large. This paper focuses on the institutional dimensions of strengthening electoral systems and grapples with issues related to electoral management bodies as institutions of governance. Through a taxonomy that classifies 148 countries according to the type of electoral administration, it argues that electoral management bodies worldwide are increasingly both permanent and independent of the executive branch of government and that this type of institutional structure proves more cost-effective than ad-hoc or temporary electoral bodies. Special attention is placed on the role and challenges of electoral management bodies in “third wave” democracies vis-à-vis the experience in older and more established democracies. This publication offers a general and comparative overview of the current situation, challenges and outlooks for electoral campaign regulations in 18 Latin American countries having introduced or re-established a solid democratic institutionally. This Guidebook is the first of its kind to identify and categorise the range of actions which political parties can take to support women’s participation during different phases of the electoral cycle, including during the pre- and post- election phases. This publication is targeted to members of political parties, particularly those in leadership roles, and to civil society organisations and gender equality activists. It is also intended to encourage global political party foundations and alliances to embrace gender equality as a norm in their constitutions and their work. 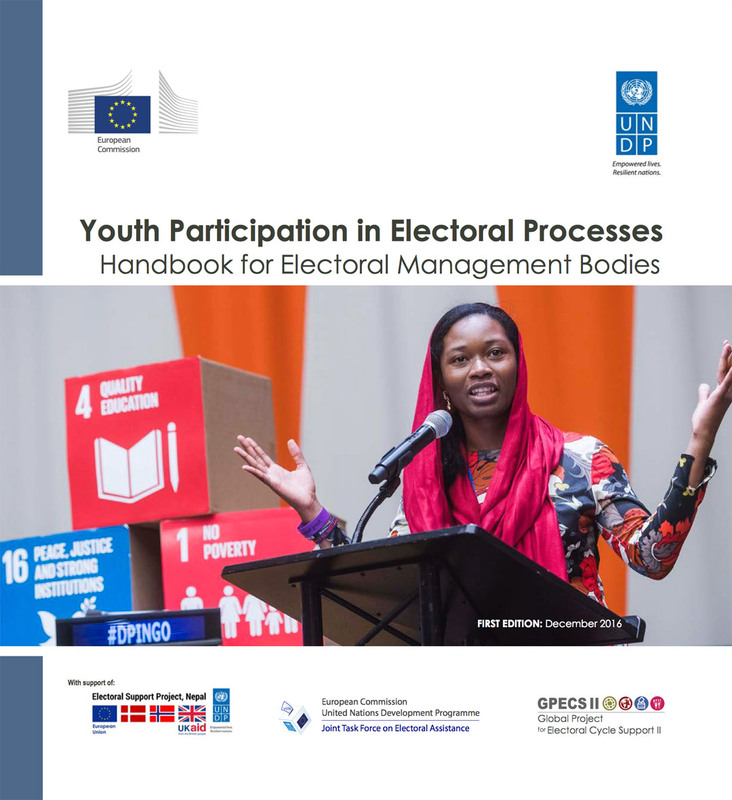 The Good Practice Guide identifies key entry points for the inclusion of young people in political and electoral processes. The publication compiles good practice examples of mechanisms to enhance youth political empowerment around the globe, focusing on innovative instruments with the potential to provide fresh inputs for UNDP programmes as well as initiatives by other stakeholder. Democracy is not just about elections, but genuine elections are a necessary condition for democracy. European Union Election Observation Missions have the task of observing and reporting on an election process in its entirety, enhancing transparency and providing an impartial assessment. This handbook is intended as a tool and a reference book with methodological guidelines and practical recommendations. This second edition has been thoroughly revised to take into account advances in the European Union’s methodology for observing and assessing an election process. The handbook underlines that EU EOMs adhere to the Declaration of Principles for International Election Observation, a landmark document commemorated at the United Nations in 2005. The handbook explains the criteria used in deciding whether to observe an election, the steps taken to establish an EOM, and how a mission functions. This paper sheds the light on journalistic ethics in media coverage of electoral processes through the analysis of four African Portuguese-Speaking Countries (PALOP) and East-Timor case studies. The handbook is based on the electoral assistance provided in the field of media and journalism which aimed at enhancing professionalism and developing ethical standards through the good application of codes of conduct set for elections. The book also comes up with suggestions for improvement with regard to a free exercise of press freedom in accordance with good international practice. This book is the result of the technical work performed by the Project to Support the Electoral Cycles in Portuguese Speaking African Countries (PALOP) and East Timor.The Handbook focuses on technology with an emphasis on their use in the process of electoral registration. Important themes are mentioned in the paper such as the electoral registration, the update of the database, the question of deaths and the list of voters, logistics for technology and data protection. This handbook summarizes the highlights of a discussion on the UNDP’s engagement with political parties. It presents a synthesis of the UNDP experiences and perspectives on the challenges and opportunities in providing political party support. This paper provides an in-depth study of political parties’ challenges and programming, UN neutrality in partnering with parties, as well as an assessment of the rationale for working with parties and an overview of the evolution of party assistance, inside and outside the UNDP. This Guide is designed to be a key reference tool for electoral practitioners including electoral management bodies, independent broadcasting authorities and international assistance providers. It aims at providing an in-depth understanding of some of the key issues related to media and elections.The Guide is comprised of ten chapters that deal with the issues of media and communications during the electoral process. Each chapter can be read independently so that electoral practitioners only concerned with one facet of media and elections can turn directly to that section as a resource. This report contains original ideas, suggestions, experiences and knowledge shared by numerous individuals through their work in the field of women’s political participation, eliminating violence against women and electoral assistance. While focusing primarily on UNDP rules, it pays specific attention to major aspects associated with the procurement and the application of ICT solutions in voter registration. This report summarises the content of the presentations, floor discussions and conclusions of a joint sub-regional forum organised by IFES, the United Nations Development Programme (UNDP) Regional Center in Cairo and the UNDP elections team in Egypt, Libya and Tunisia, which was held in Cairo from 9 to 11 April 2012. One main purpose of the forum was to provide both theoretical and practical comparative perspectives on the international standards and principles for Electoral Management Bodies (EMBs) to electoral administrators and other stakeholders, mainly from Egypt, Libya and Tunisia. This paper focuses on the Asia-Pacific region and makes general policy recommendations to improve the quality of local elections management and to aid assistance providers in offering targeted support at the local level. In addition to advocating for an increased participation of women in the election process and better civic and voter education, the report ultimately aims to reduce electoral violence, increase transparency, cost effectiveness and voter turnout. The UNDP Electoral Assistance Implementation Guide provides the ‘how to’ fundamentals of planning and implementing electoral assistance using the concept of the electoral cycle, as well as specific guidance on project design, resources, partnerships, procurement, evaluation and other areas. Whilst this is designed as a guide for UNDP staff, others can learn from UNDP’s approach and access a wealth of resources on planning, formulating, implementing and monitoring electoral assistance. Intended for UNDP democratic governance practitioners, this report analyses and summarizes a mapping of UNDP’s engagement with political parties that was conducted in October 2003 and updated in May 2005. The information contained in the mapping is indicative rather than exhaustive and reflects the various ways UNDP Country Offices are currently working and engaging with political parties. The mapping will serve as a key reference for informing the development of UNDP’s corporate policies and practices concerning political parties. This publication offers a new look at recent evolutions in media freedom, independence, pluralism and journalist safety. The overarching trend observed throughout is one of disruption brought on by technology and to a lesser extent the global economic crisis, with mixed results for freedom of expression and media development. The publication comes at a critical moment for press freedom amid unprecedented opportunities for expression of new voices as well as new forms of restriction, surveillance and control. World Trends in Freedom of Expression and Media Development is a key resource for governments, the media, academia, the private sector and civil society and is an essential read for anyone interested in the contemporary media environment.